A student makes the most of his time in the Living-Learning community. Photos by Phil Jones. On August 13, 2016, Augusta University ushered in a new era by welcoming the first class of undergraduates to the 412-bed Oak Hall, the university’s first true undergraduate residence hall. It was a big day for both the students and the university. Not only were undergrads now living on campus — and among the white coats populating the Health Sciences Campus, no less — but they were enjoying a wide range of new services and activities geared toward making their college experience especially rich and rewarding. 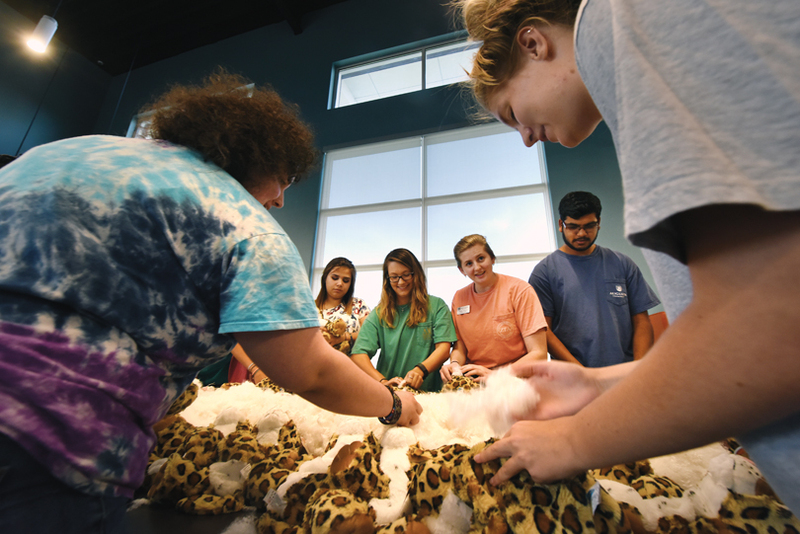 With the residence halls in place, the university was finally able to give students a traditional residential experience, complete with food service, a transportation system and recreational activities designed specifically for this new breed of Jaguar. A year later, we look back on how student life has evolved. 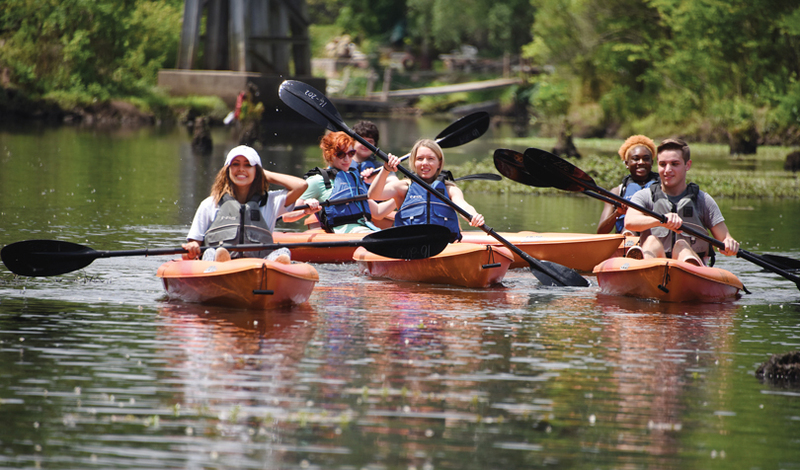 Students kayak down the Betty’s Branch tributary of the Savannah River. Perhaps nowhere is the work being done to enhance the student experience more obvious than at the Wellness Center, located in the Student Center just a short stroll away from Oak Hall and the 312-bed Elm Hall, which houses graduate and professional students. After undergoing an extensive renovation in anticipation of the incoming residential students, the Wellness Center, previously a hodgepodge of colors and themes, now boasts a coordinated look that leaves no doubt that you’re in the heart of Jaguar Nation. One of the most popular additions to the recreational offerings has been the kayak rental program, which takes advantage of Augusta’s wide-ranging water resources by allowing a student to check out up to two kayaks overnight, complete with a map of suggested locations and a helping hand when it comes to loading and unloading at the Student Center. The Betty’s Branch area of Columbia County is the most popular spot for these excursions, Davis says, although all the locations offer beautiful scenery and a fun outdoor experience. Another incentive to get students outdoors are the two Georgia State Park passes that are now available for rent. 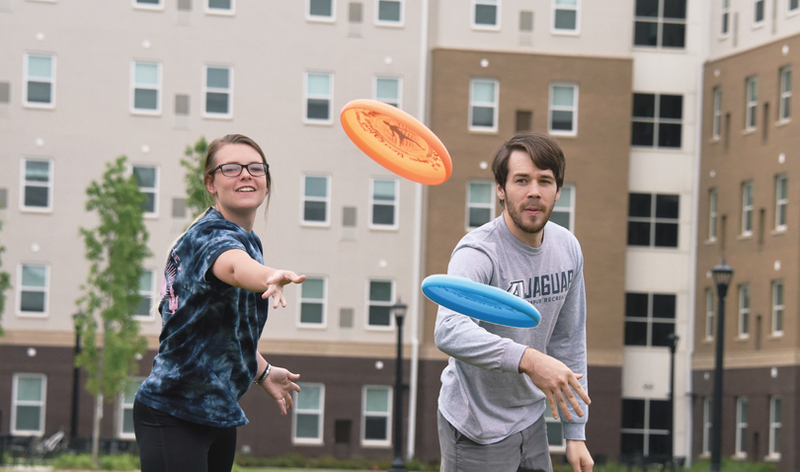 Jessica Fleming and James Crockett play Frisbee on the Jaguar Park greenspace. Closer to home, the big grass field between Oak Hall and the Student Center is fast becoming a go-to spot for organized intramural activities or, when not in use, a pickup game of Frisbee. While much of Davis’ programing is geared towards getting students out into the community, Joe Pierce, director of student engagement, is all about creating an inclusive and vibrant campus culture, which is easier now that so many undergrads are living on campus and are therefore naturally becoming woven into the school’s cultural fabric. 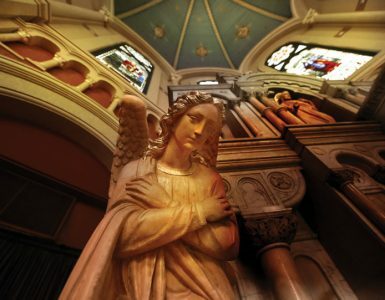 “We are definitely developing more of a campus culture,” Pierce says. An example of that was this year’s Paint Palooza and last year’s Homecoming variety show, which sold out the Maxwell Theatre. With so many students living on one campus and attending classes on another, Pierce has occasionally moved the inflatable movie screen often used at the D. Douglas Barnard Jr. Amphitheatre on the Summerville Campus to Jaguar Park. In colder months, he even uses the screen at the nearby Lee Auditorium. And when Movie Night happens to be on the Summerville Campus, buses make it easy for Oak Hall residents to get there. 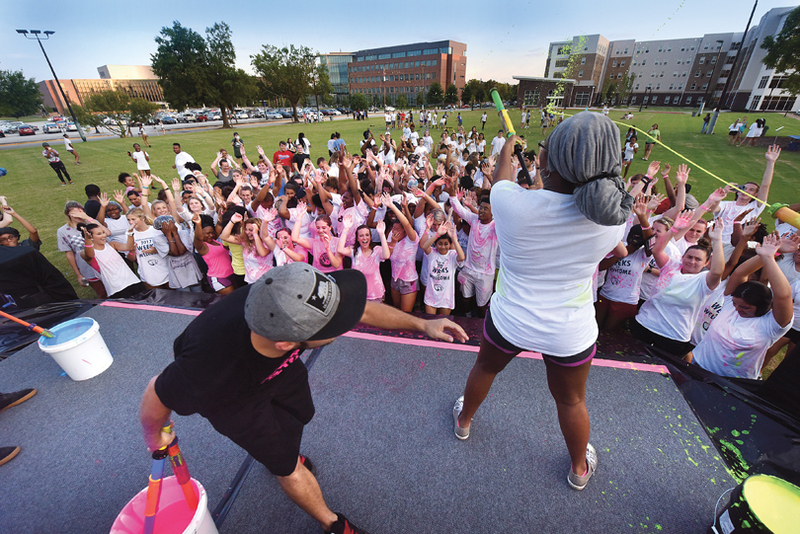 This fall also marks the debut of JagLife, an online engagement platform that makes events even easier for students to find and for student organizations to promote. It also gives Pierce and his team valuable data regarding participation, which will help them tailor future activities. Students participate in a Build-a-Jag event. 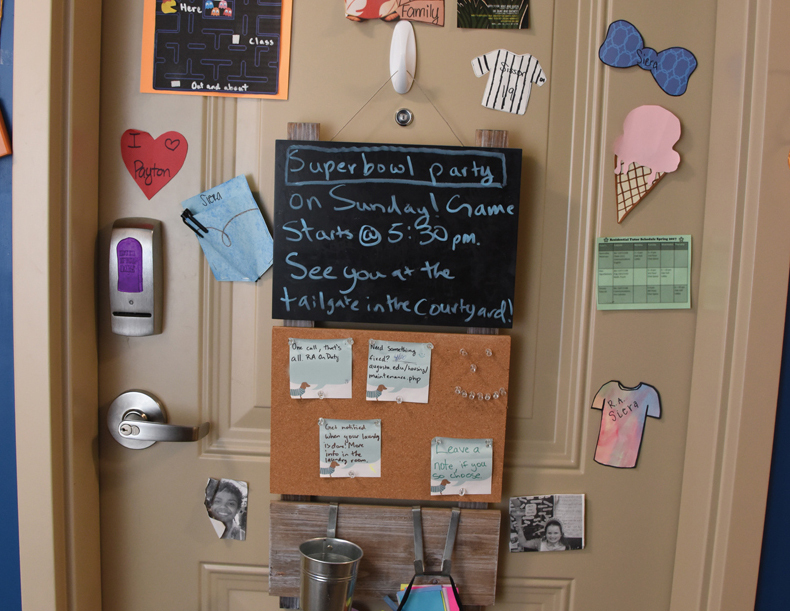 When the second crop of freshmen moved into Oak Hall this August, an energetic culture of individual attention had already taken root, built around a floor culture led by specially trained resident assistants. “Each floor takes on the personality of that RA, so we are very intentional about developing connections with the students and creating plans so that the individual floor personalities shine through,” says Dr. Heather Schneller, director of housing and residence life. This year, the College of Science and Mathematics is increasing its participation in the Living-Learning Communities, which give participating students an enhanced academic experience by grouping them into cohorts that live and study together. According to Schneller, talks are underway with Pamplin College of Arts, Humanities and Social Sciences to perhaps develop a Living-Learning Community of its own in the future. In addition, the new coordinator for academic initiatives and student leadership programs will be rolling out hall councils as well as an overall governing body for all residence hall students, which Schneller says will help solidify the student connection. 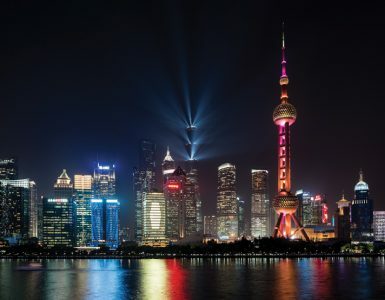 Part of that includes going beyond programing and into really getting to know the individual students, which the floor-level attention allows. 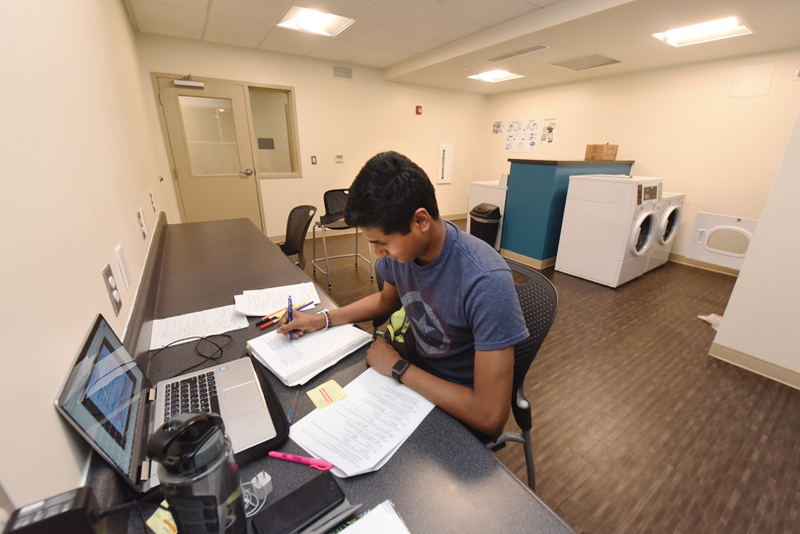 While everything from a Build-a-Jag event to studying while doing a load of laundry seems to integrate students into life in the residence hall, sometimes it’s the spontaneous mischief that makes Schneller smile. One of last year’s offenders is now an RA. Besides having the facility at full capacity this year, Schneller is proud of the fact that 174 of last year’s residents have contracted to live in the University Village complex near the Forest Hills Campus. That not only shows that the students have connected to the student organizations and made those meaningful connections with faculty, it also means they enjoyed their housing experience and trust the university to follow through on their housing promise. “That speaks volumes to what we’re continuing to do,” Schneller says. Resident assistants set the tone for their floors.